The Profit & Loss (P&L) is a planning model that provides flexibility in top down or bottoms up planning across all revenues and expenses. 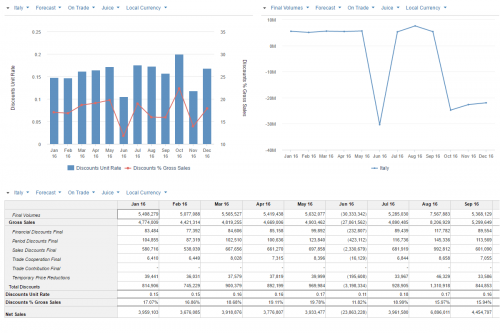 The model also includes reporting dashboards that provide key insight and analysis to the Income Statement. 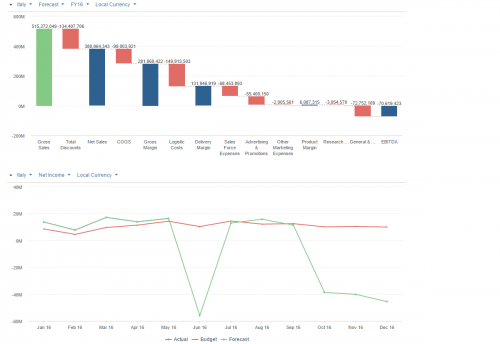 The P&L landing dashboard summarizes each step of the model in the Profit & Loss waterfall chart. Users can navigate easily throughout the model on this landing page. The Profit & Loss Summary enables users with more insight into EBITDA and compare various account trends across different scenarios. The Variance Analysis includes gross sales variance by project along with a chart highlighting the variance by sub-brand. The Net Sales Summary allows the user to analyze the monthly trend of discounts and the monthly trend based on the account selected. 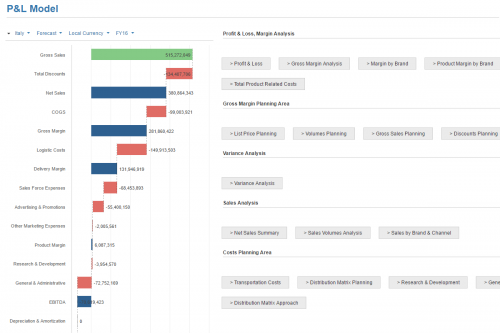 The List Price Planning Summary provides the user with a summary view of the list price planning along with a chart showing the price trends based on the different planning approaches. 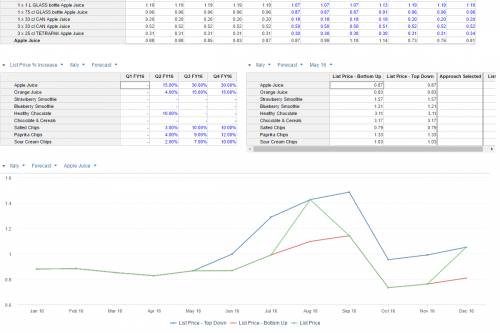 List Price Planning provides the flexibility to select a top down approach that provides input for a percentage increase / decrease at sub-brand level or a bottom up approach that provides input at SKU level. Sales Volume Planning calculates gross sales on either top down or bottom up approaches. When gross sales has been adjusted by amount, sales volumes will be recalculated assuming list prices are constant. The recalculated item is represented by sales volume final. 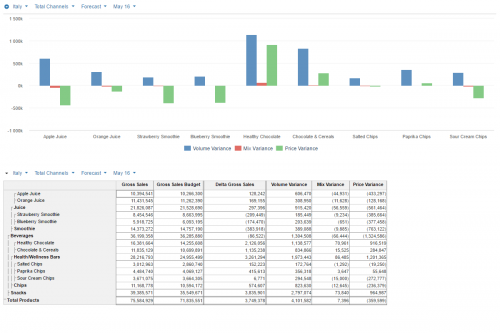 Net Sales Reporting provides reports and dashboards dedicated to net sales analysis. Net Sales are calculated as final gross sales minus all the discount lines planned. COGS Planning is completed through a bottom up approach by inputting unit rate at SKU level of detail. An additional COGS account line is also available in order to store the variance in comparison to standard costs in actual data. Variance Analysis Reporting provides comparison across budget and forecast scenarios. Reporting is also enabled across volume, price, and mix. Cost Planning provides unique planning approaches across different cost categories. Transportation costs are planned using a driver based approach, Sales and Marketing costs are planned using a distribution matrix approach, and R&D and G&A costs are planned using a top down approach. P&L Landing Dashboard enables users to easily navigate within the model through the Profit & Loss summary waterfall chart.